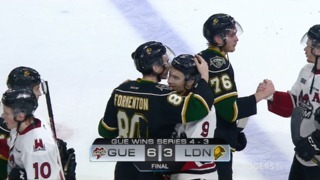 Inexperience proved insignificant on Saturday night in Sarnia as the London Knights toppled the Sarnia Sting 6-3 to sweep their annual pre-season home and home series. With a lineup that featured five 16-year olds, the Knights struck for six goals in the second period to erase a 2-0 Sarnia lead and never looked back from there. The top three London picks from the 2018 OHL Priority Selection each scored a goal and Jordan Kooy kicked away 30 shots and Vladislav Kolyachonok easily led the game in blocked shots. The 17-year old defenceman from Belarus even held in to block a slap shot after a whistle had gone. The Knights are now 2-0 to begin the pre-season and will have just under two weeks off from games before finishing with a game at home to Erie and a game in Komoka against Erie. Ruzicka got the Sting rolling in the first period. He forced a turnover on the left side of the London zone and picked up an assist on Calvin Martin’s first of the pre-season. Martin re-directed a Jamieson Rees shot past Jordan Kooy to make it 1-0. With time winding down, Ruzicka pounced on a loose puck outside the Knights’ blue line, zoomed into the London end and ripped a low wrist shot into the net with just over 13 seconds left on the clock and Sarnia headed to the dressing room with a two-goal lead. A couple of subtle adjustments and an intermission to re-focus saw the Knights come out early and often in the second period. 2018 second-round pick, Antonio Stranges flew down the left wing side of the ice and put a snap-shot past Londoner Aiden Hughes 47 seconds after the opening face-off. 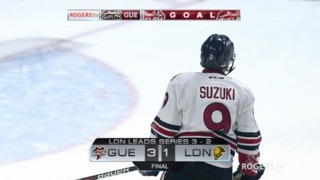 Less than three minutes later, 2018 first-round pick Luke Evangelista tied the game for London with a goal that seemed to rattle Sarnia. As he trailed behind a rush into the Sting end, Connor McMichael took a feed from Evangelista and glided into the slot before burying a shot to give London a lead they would not give back. Ryan Bangs drove the net at the end of a power play and knocked in a rebound to make it 4-2 at 11:12 and then Matvey Guskov finished off a run of five unanswered goals by the Knights. 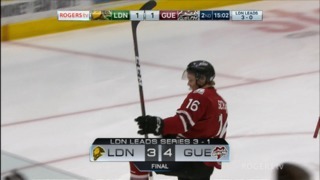 Guskov took a breakaway pass from Richard Whittaker and although he was stopped on his first attempt, Guskov slid in his own rebound between Hughes’ pad and the post to extend the London lead to 5-2. London’s other second round pick in ’18, Sahil Panwar scored with 20 seconds remaining in the period to complete the scoring. Evan Bouchard scored a goal, added an assist and was named the game’s first star in the Knights pre-season opener against Sarnia and now he is off to Edmonton next week for Oilers training camp. It will be up to Edmonton to decide whether he is ready to begin his NHL career. The only other place Bouchard can play this year is London. The Oilers selected the Oakville native tenth overall in the 2018 NHL Entry Draft. 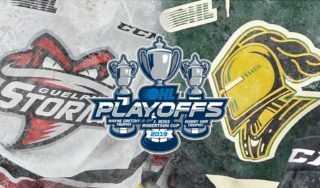 The London Knights do not play another pre-season game until September 14 when they will kick off another home-and-home with the Erie Otters. The teams will play a Friday night game at Budweiser Gardens at 7:30 and then play Erie in Komoka on Saturday, September 16 at 7:00. That will finish London’s pre-season schedule. They will open the regular season at home against the Windsor Spitfires on Friday, September 21.